Having been living as a Parisienne for over 6 years now, I often get asked if the city is worth visiting. My response? YES, absolutely. You must come. You need to come. How soon can you fly over? Did you hear Air France was having a sale??? Bottom line is, I love Paris and come rain or shine my response to this question will always be yes, come and visit, because Paris is a truly remarkable place. Paris is a place where people fall in love. And no, not just in the romantic sense of the word. People fall in love with the architecture, the cobblestone streets, the bakeries, the bistros, the food, the gardens, the history, the markets, the wine…the list goes on. People simply love to love Paris and I know that in my case, the city has stolen my heart. Start the day off early in a beautiful place with the most important meal of the day – breakfast! Le Grenier à Pain (38 rue des Abbesses, 75018 Paris) is one of my favourite bakeries in all of Paris, selling one of the best and cheapest croissants around. It’s popular with locals and their croissants are mouth-watering. When you have your croissant, head over to the “I Love You Wall” opposite the metro station Abbesses and sit in the small park surrounding it. This one-of a-kind piece of art is one of my favourite things in the city and with “I love you” written in over 250 different languages it’s a wonderful place to start the day! When you have finished make your way up the hill to the village of Montmartre. Famous for its cobblestone streets, this gorgeous part of Paris is totally and utterly unique. Artists such as Picasso were inspired by its beauty and it won’t take long for you to understand why. Take a stroll around Place de Tertre to see the artists’ paintings and if art is your passion, be sure to check out the numerous galleries and the Dali museum. Last but not least, visit the inside of the Sacré Coeur and afterwards enjoy the spectacular view of the city from the steps. Every time I stand there, I have to pinch myself to be sure I’m not dreaming. 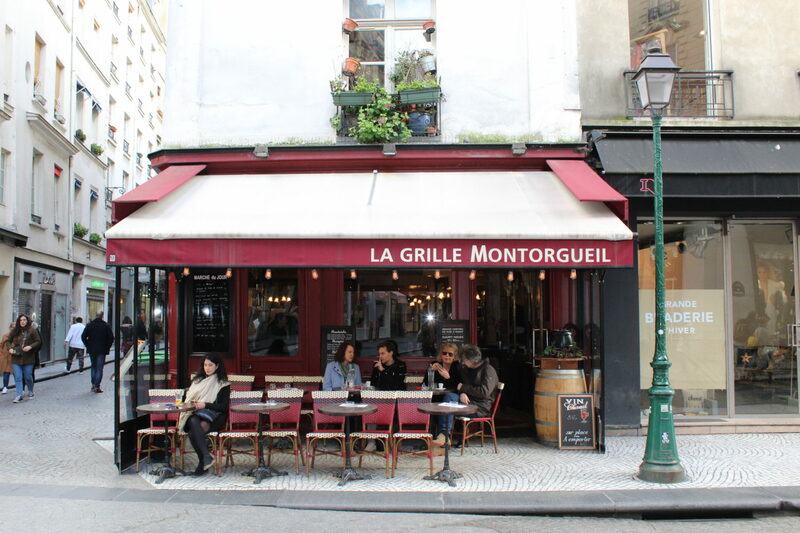 Although Montmartre is considered to be somewhat of a touristic area, it still has some fantastic cafes, bars and restaurants. One of my all time favourites being Le Basilic (33 Rue Lepic, Paris 75018). This small, charming restaurant is covered with overflowing ivy and resembles something out of a fairy tale. I still remember how much it caught my eye the first time I saw it! The restaurant is as beautiful on the inside as it is on the outside with wooden beams, antique furniture and a huge fireplace. The service and food are excellent making it the perfect place to try traditional French food in an authentic French restaurant. I would recommend the Duck confit followed by the Mango Crème brûlée! Mmm délicieux! My favourite park in Paris has to be the Luxembourg Gardens and I’m not alone. Locals and tourists alike flock to this delightful park to admire the Medici fountain, the Luxembourg Palace and the beautiful sculptures. When you live here, the gardens also become a peaceful place where you can sit at one of the fountains and read a book while children play nearby with vintage toy-sailboats. It’s an exceptionally pretty place and it’s where I go to when I need inspiration! After a leisurely walk through the Luxembourg Gardens, head out into the Latin Quarter because it’s time for some shopping! Paris is the fashion capital of the world so of course if you live here you can’t resist a little bit of a splurge from time to time. Saint–Germain–des-Prés is a fantastic area for shopping with both quirky affordable shops and shops selling chic high-end brands. This combination means that whatever your budget, you can shop until you drop in this lovely arrondissement. When you need to put your feet up pop over to Bar du Marché (75 Rue de Seine) for a delectable cocktail in a Parisian setting. Or, if it’s cold outside, try La Jacobine (59 Rue Saint André des Arts 75006 Paris) for their incredible Aztec hot chocolate! I think it’s the best in Paris! The Louvre is an amazing museum but if you only have 24 hours it would be impossible to see it all, it’s just too big! I actually love to see the outside of the Louvre at night. The pyramid is lit up and the Museum (which was previously a palace) has its own lights which accentuate its stunning architecture and incredible facade. If I only had a day, this would be something that I would want to see, the mix of the old and the new living in perfect harmony together – what a beautiful sight! After soaking in the view, I would make the short walk over to Pont Neuf to take a dinner cruise along the river. The view of the Eiffel Tower sparkling from the boat is, in my opinion, the best view of the Iron Lady. The food on the cruises is marvellous and experiencing Paris at night is simply breathtaking. Lastly, I couldn’t think of a better way to wish Paris a good night and round off what would be, my perfect day in Paree. Come as soon as you can 🙂 thank you for commenting! Nice suggested itinerary, a good mix of different places without doing too much! Montmartre is one of my favourite areas as well and since it’s up so high, you’ve got those great views of the city and are thus seeing more! Doing some of both banks is a must… as is some good French food! Love it! I need to do a cruise before I leave! Oh I’ve never seen the I Love You wall! What a beautiful idea 🙂 Great itinerary! I’ll be sure to share it with friends who are coming to visit Paris in a couple of weeks! You have to see it Molly! It’s so pretty. Thank you for commenting and I hope your friends enjoy my itinerary! Brings back all the memories of why I love Paris. I am definitely going to do a dinner cruise sometime soon! You should Laura! It’s wonderful! Thank you for commenting! This is such a beautiful article! It’s making me want to hop a plane right now and spend the day in Paris. I’m so glad to got to try the hot chocolate from La Jacobine with you last year. Give Paris a kiss for me. Xoxo. I can’t wait to visit Paris again in March and this article reminds me of the wonderful places I have already seen. I’m now so looking forward to experiencing the things I haven’t done yet that you mention too. Thank you great read. Thank you for commenting! I’m glad you enjoyed it! I love this post!! I have lived in Paris for over a year now, and haven’t done half of these things! I have to do the dinner cruise on the Seine. Everyone says it’s amazing!! This is such a great itinerary and I’m giving everyone the link who asks me what they should do in Paris, Thank you for sharing Chloe!! What a beautifully written story Chloe. I am instantly saving it to my Paris Pinterest Board so I can visit all those food places you recommended on our next visit – if we are that lucky! Thank you for such a kind and lovely comment Shea! I’m glad you liked it! Really intersting piece Chloe – I’ve never seen the I Love You Wall, it will definitely be on my list the next time I vist. It was delicious Fiona! Loved your article too. I will definitely visit the Art Squat, I didn’t know it was free!